Provide comfort for the family of Trudy Plemons with a meaningful gesture of sympathy. On February 8, 2019, the family of Trudy (Gertrud) Eulberg Plemons began to experience life without her in it, just days before her 95th birthday. Born on February 16, 1924, in Koblenz, Germany, she passed peacefully at her home in Athens, Tennessee with loved ones providing comfort. It's customary to include a synopsis of someone's life story at his point. 95 years of life cannot be shortened into a few sentences. Suffice it to say she was exemplary. We have stories that will be told for generations. She left the universe a much better place simply by her existence. Trudy is preceded in death by her husband, Col. Hal C. Plemons, her parents Joseph and Francisca Eulberg, and her sister Suzanna Eulberg Kernbach. She is survived by her four children, Joseph Plemons, Patricia Garwood, Steve Plemons, Michael Plemons and daughter-in-law, Sylvia McCosh Plemons; her grandchildren, Matthew Garwood and Andrea Bell Garwood, Brittany Garwood, Hillary Plemons, Katie Plemons Ponsot and Tommy Ponsot, Christopher Plemons, Holly Plemons, and Nathaniel Plemons; her great-grandchildren, Marquice Dunn, Malia Campbell, Louisa Ponsot. Trudy also leaves behind special friends, Jenny Jeffreys, Ingrid Cooley, and Gunther Krupp. A memorial service will be held, 2:00 pm, Thursday, February 14, 2019 in the chapel of Smith Funeral Home with Father John Orr officiating. The family will receive friends from 1:00-2:00 pm at the funeral home prior to the service. In lieu of flowers, please make donations to the McMinn Regional Humane Society, 219 Alford Street, Athens,TN 37303; or the National Audubon Society, 225 Varick Street, New York, NY 10014. To send flowers in memory of Trudy Plemons (Eulberg), please visit our Heartfelt Sympathies Store. Your work family sent flowers to the family of Trudy Plemons (Eulberg). My heart is very heavy, since hearing of Trudy's passing. She was the wiseest and one of the kindest ladies that I ever knew. She will be missed by all who ever knew her. My prayers to all the family are for comfort and strength during this difficult time. 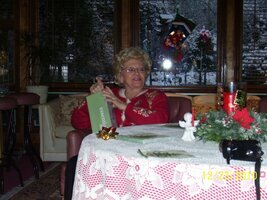 OMA was a very special person and we who had the privilege to know her are better for having had that privilege!